Not all gifts are created equal, and the same goes for the little rules built up in our minds about gift giving. Some gift giving etiquette is simple common sense and kindness; for the rest, it’s true that it’s the thought that counts. 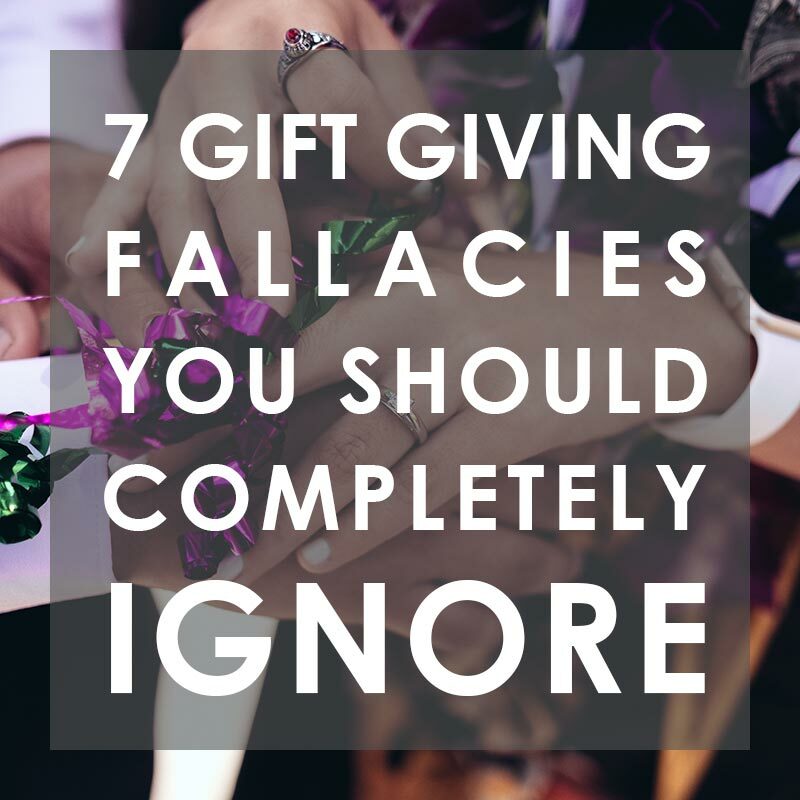 Let’s take a look at seven gift giving fallacies that you should completely and totally ignore. The gift has to arrive by December 24th to count as a Christmas gift! We have to have it in hand by their birthday! I mean, yeah, if you’re the type of person who habitually forgets birthdays and anniversaries, constantly scrambling for a last-minute gift, you should probably focus on getting a gift ahead of time. Doing so shows that this person is important enough to you that you will spend the proper time preparing. The trouble is, you found this and ordered it two days before her birthday, and since it’s custom-made, it’s going to show up after the holiday, birthday, graduation, etc. Guess what? That’s ok! If it’s something special that they will have for the rest of their life, a few days shouldn’t be a big deal. Take (or download) a picture of the item, slip it in a card, maybe toss in a small coffee gift card, and they’ll be fine with it. Some people fall into the trap of thinking you have to give stuff. If there’s not something to unwrap then it doesn’t count – or so the theory goes. Many of us already have tons of stuff. The last thing we need is more. The idea that a present needs to be unwrapped is one of the most hobbling gift giving fallacies, because it will seriously limit your options for a truly meaningful gift. Consider giving an experience – a date at a nice restaurant, a luxury photo shoot, a vacation, a day at the trampoline park. This sort of experiential gift will often be remembered and treasured long after all the other stuff has been tossed out. We love us some beautiful gift wrapping. A good wrapping job shows care and creativity, and can be a work of art. So just to be clear we’re not anti-wrapping fruitcakes. But on the other hand… Seriously, do you need to waste $5.95 on a roll of paper that’s just going to be ripped up five minutes later and then tossed into a landfill? Do you need to keep an entire drawer filled with bows and ribbons and tissue paper, all of which will be sent directly to the trash bin? *Although we’ve been known to get pretty crazy with fancy-upcycled-DIY-art wrapping as well. Use your imagination, and you can easily save on both the financial and environmental cost of wrapping paper. This one makes a certain amount of sense. After all, nothing goes over as poorly as re-gifting something you used twice, or passing along some old clothes, books, or movies. Does that mean all used gifts should be avoided? Some people are way into vintage and antiques – just look at mega-site Etsy, or mega-hits like Antiques Roadshow. Sometimes the very best gifts are used: a first-edition book, or a rare vinyl LP, or a 16-year-olds first car. So don’t limit your search for the perfect gift to items in nice packaging at the mall or Costco. Think outside the box, and if it’s the perfect fit, it’s a great gift, regardless of how new it is. This is one of those gift giving fallacies that I can easily fall prey to. You, too, most likely. We all love to give that perfectly memorable, one-of-a-kind, “WOW” gift. And those types of unique, creative gifts are great; in fact, that’s our main goal at Northwest Gifts – to provide a stellar selection of unique, memorable, and “wow”-worthy gifts. So does that mean you should always try to get the most interesting and unique gift possible? Sometimes it’s ok to do. We totally recommend going the extra mile, finding that “just perfect” gift they totally love. But you can’t always top last year’s gift, and sometimes people simply try too hard. The fallacy is in thinking it’s a bad thing to get them something simple, something practical, or something that they said they want. So maybe the Batman trilogy on Blu-Ray isn’t the most unique gift in the world – so what? If someone likes Batman, get them Batman. You don’t need to find some weird hand-knit batman beanie mask that they’ll never wear in real life. Just get them the Blu-Ray… the one they actually want. Parents will often fall into this when getting the kids Christmas presents. (I know we do!) Child A has 3 presents that cost $100, and we found 2 **completely perfect** presents for Child B that set us back just $45. So we owe Child B another $55, right? Or maybe last year you bought your spouse an incredible necklace that cost a few grand. You don’t mind, because: love. This year, do you need to meet or exceed last year’s spend? Gifts shouldn’t be about the dollar amount. If it is, just write a check. Gift giving is great because it’s fun to give. It’s fun to find a great deal on a special item, or find that completely niche thing you didn’t even know existed until you stumbled across it online. It doesn’t have to cost much in order to make it special. Of course, price is important; it’s part of what limits just about everyone’s gift giving, and there really is no way to compare a car, diamond jewelry, or an exotic vacation with a DVD from the $5 bin and a box of microwave popcorn. But you know what? There’s a time for everything. Sometimes the right thing to do is splurge and get that cruise, that diamond-studded earring set, that billiards table, that piano. And other times the right thing to do is give a $20 coffee gift card. The rule that gifts need to be expensive is bogus. The important thing is giving generously and thoughtfully with where you are at in life. Oh shoot, she got me a $50-60 gift and mine was only $20! Darn, he gave me a gift and I didn’t give him one…. What the heck, why did I go out of my way to get this super special custom-ordered personalized vintage plaque for this couple, when they just picked me up a book from the bookstore? Nope, nope, nope. You’re missing the whole point. Gift giving is about giving. A gift isn’t an exchange – that’s commerce, and we do it way too much anyways. Gift giving is about giving. Give with a generous heart, and receive without feeling obligation. You shouldn’t feel guilt when your gift (or lack of gift) doesn’t compare with their pricey one. And vice versa. We all like to repay our debts, and no one likes to feel like they owe anyone anything. That’s all fine and good. But don’t bring that in to gift giving, and don’t put up with others doing it to you. 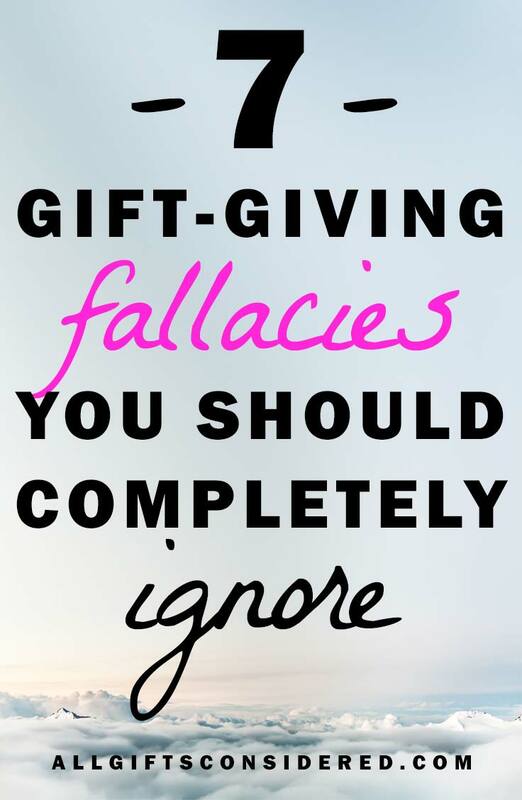 There you have it, 7 classic gift giving fallacies that you should completely ignore. Because: you’re better than that. Enjoy your gift giving experience!